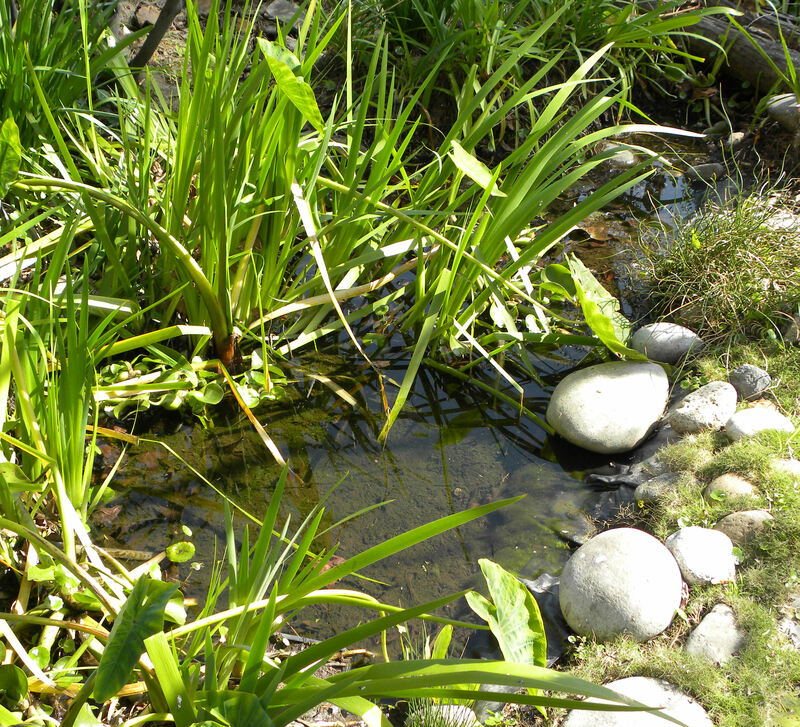 I built our front yard pond myself. We gave it a "lick and a promise" cleaning last month, but it needs additional work to keep ecological succession at bay. Spring has arrived here on the coast of southern California. 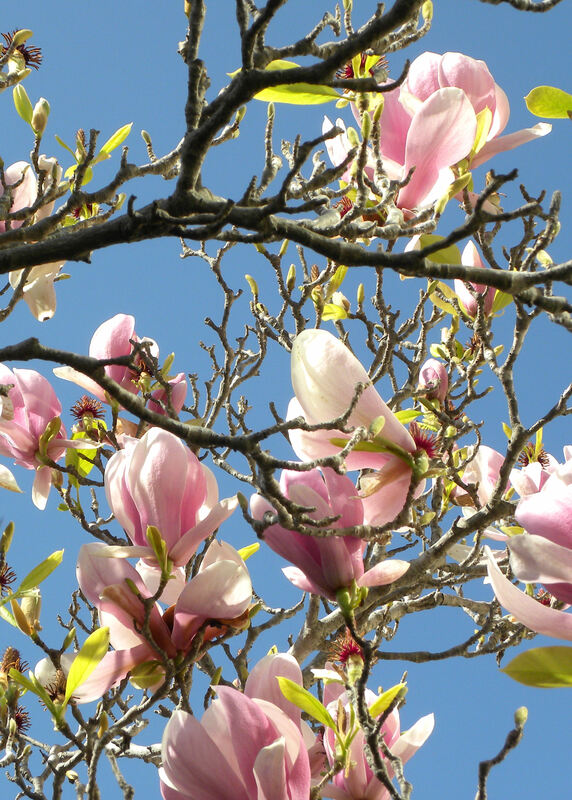 For us, spring is a long, drawn-out affair, with new things popping into bloom every week. 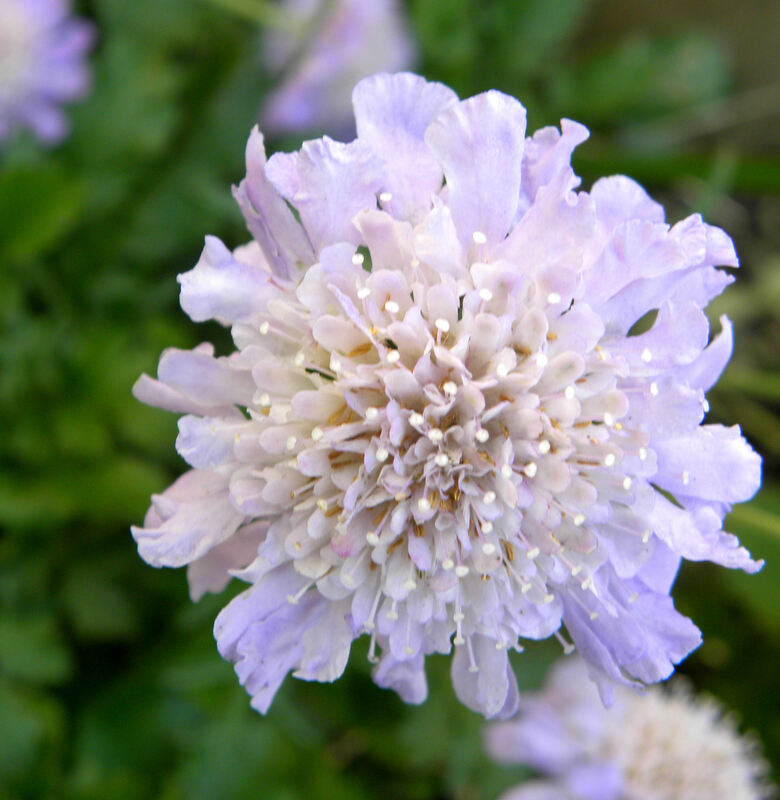 This year, I plan to photo-document what is in bloom each month, posting the results around mid-month. We have a small yard, 6,000 square feet, with most of the ground occupied by house, driveway and sidewalk. Still, I do the best I can with the space that I have, growing food, maintaining habitat for wildlife, and having flowers to lift my spirits. 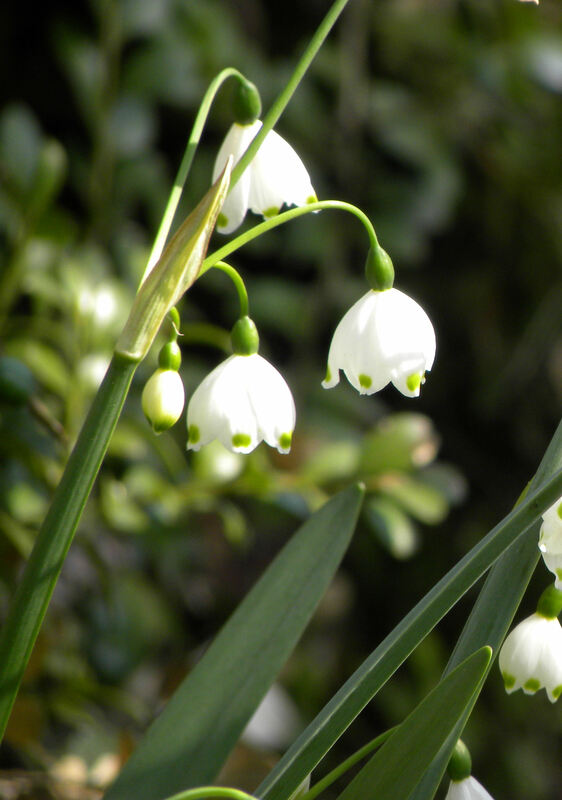 The paperwhites that I planted by the side of our pond and dry streambed have finished blooming, but the snowdrops are in their prime. Our pink magnolia tree is quite pretty this time of year. 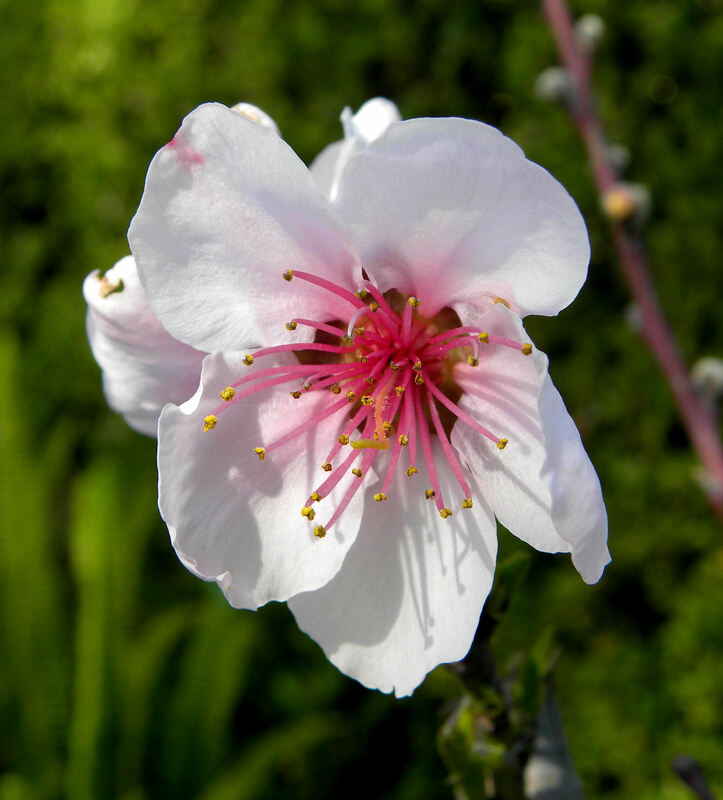 Our August Pride peach is the second of our stone fruit trees to come into bloom, with the first blossom on Feb. 14 this year. 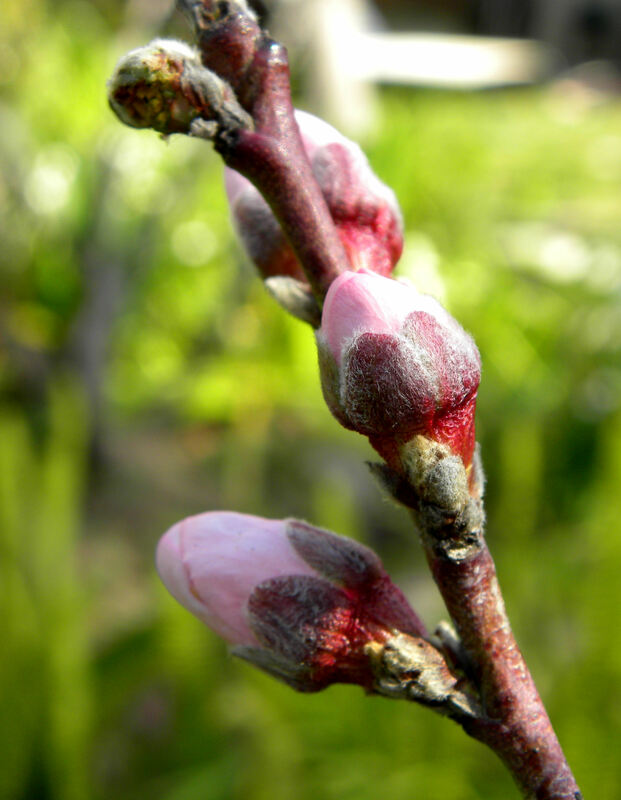 Most of the August Pride peach flowers are still in tight bud. 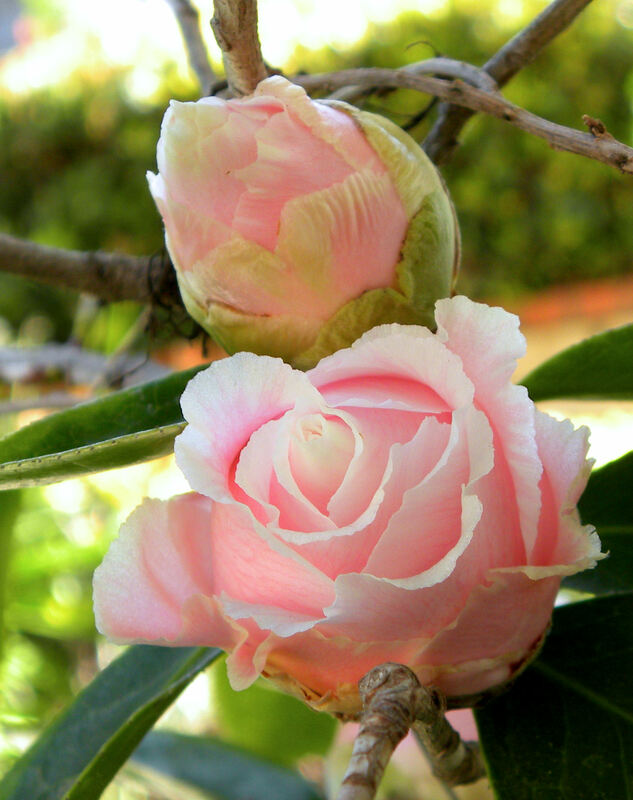 With three camellia bushes by the front walkway, we should have pink blossoms from January into March. 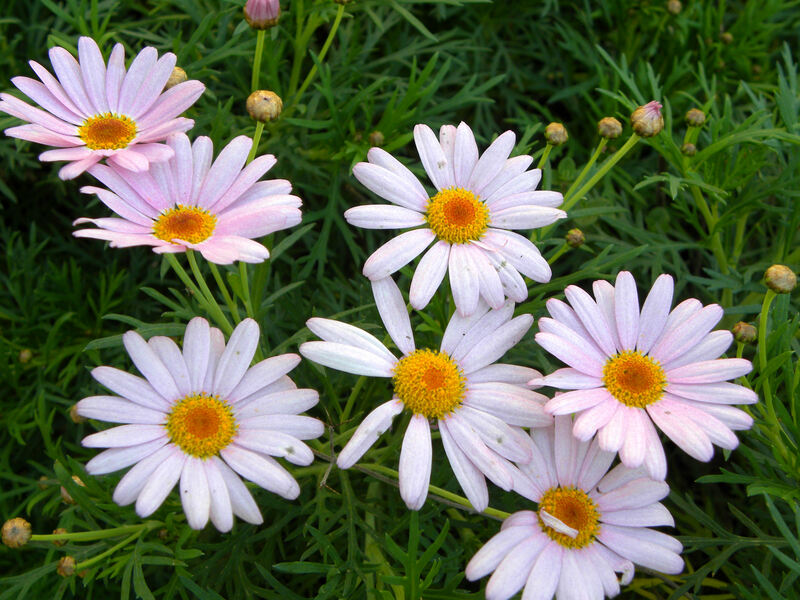 Pink cobbity daisies carry out the pink theme for February on the other side of the front walkway. 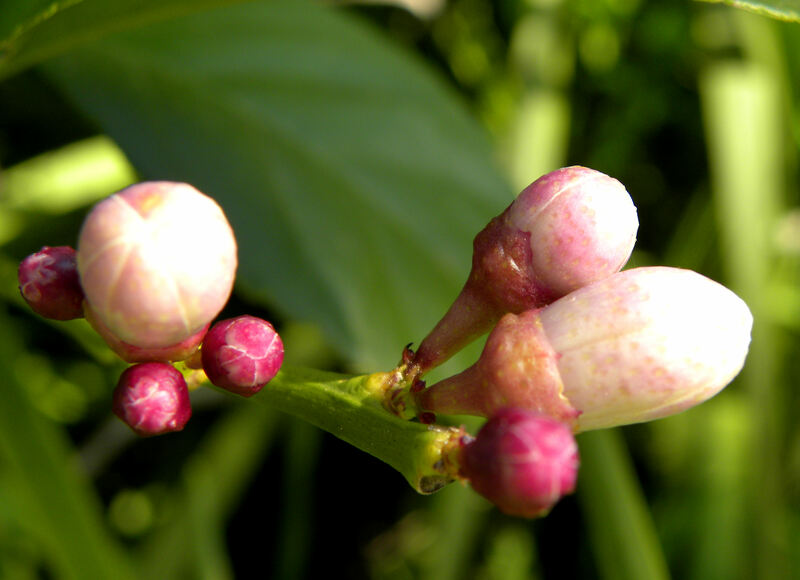 Even the flower buds on the dwarf Eureka lemon tree are pink. 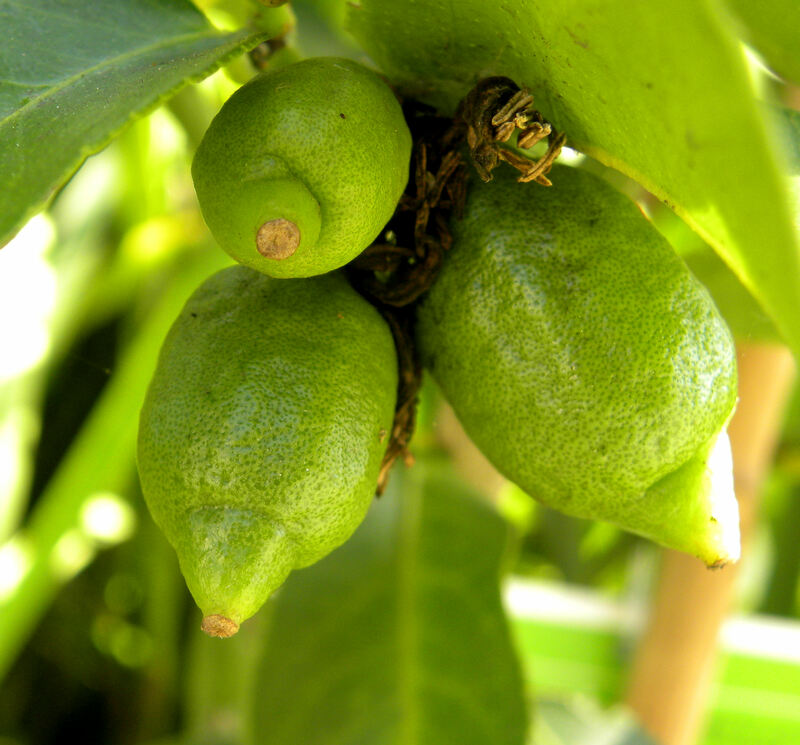 One out of three of our dwarf Eureka lemon trees has set fruit already. 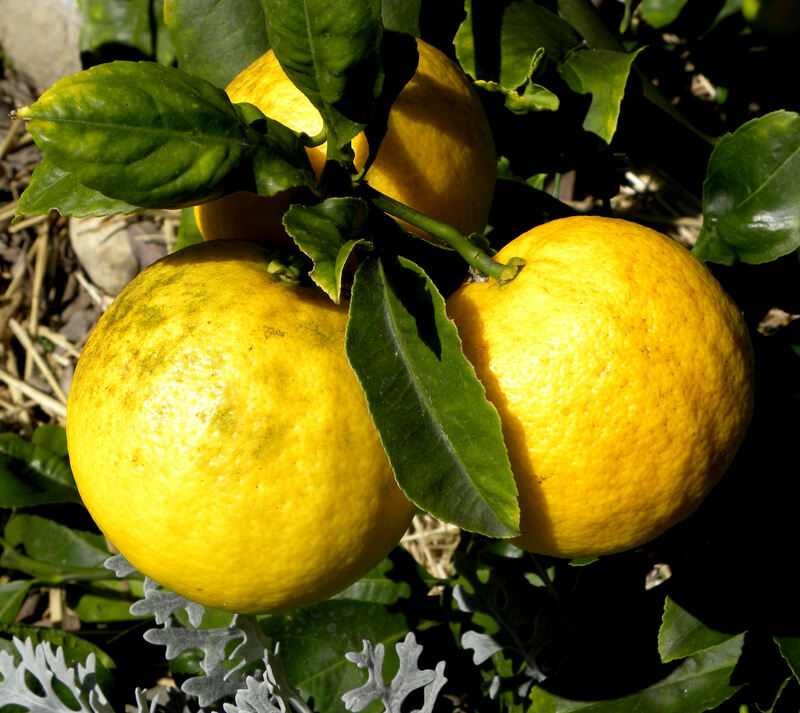 The Eureka lemons have pointier ends than the Meyer lemons and are more sour. 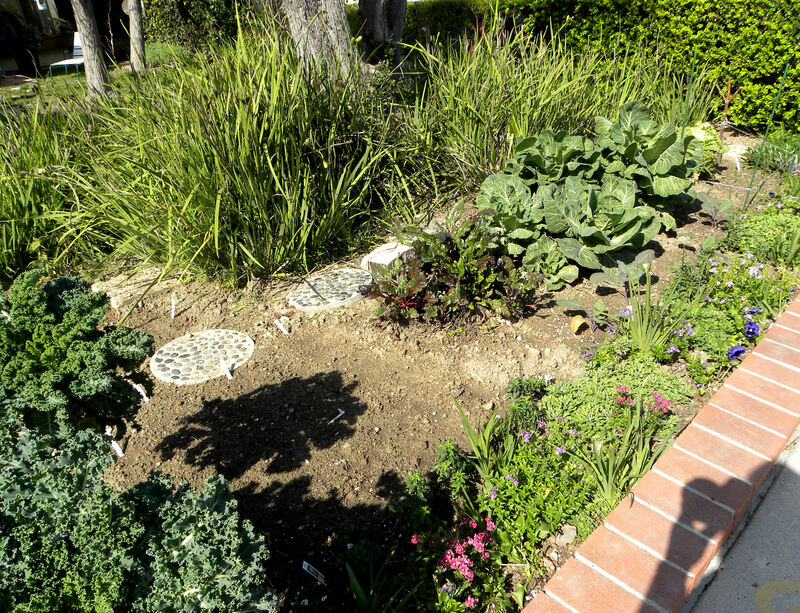 The Garden of Infinite Neglect by the front sidewalk is looking less neglected than usual with a refurbished flower border. I have kale, collards and beet greens ready when I want them, savoy cabbages that might ripen some day, hopeful sprouts of yellow onions, and newly planted seeds of beets (Chioggia and Lutz Greenleaf), Bright Lights chard, baby bok choy, and yellow summer squash. Garden of Infinite Neglect from the other direction. 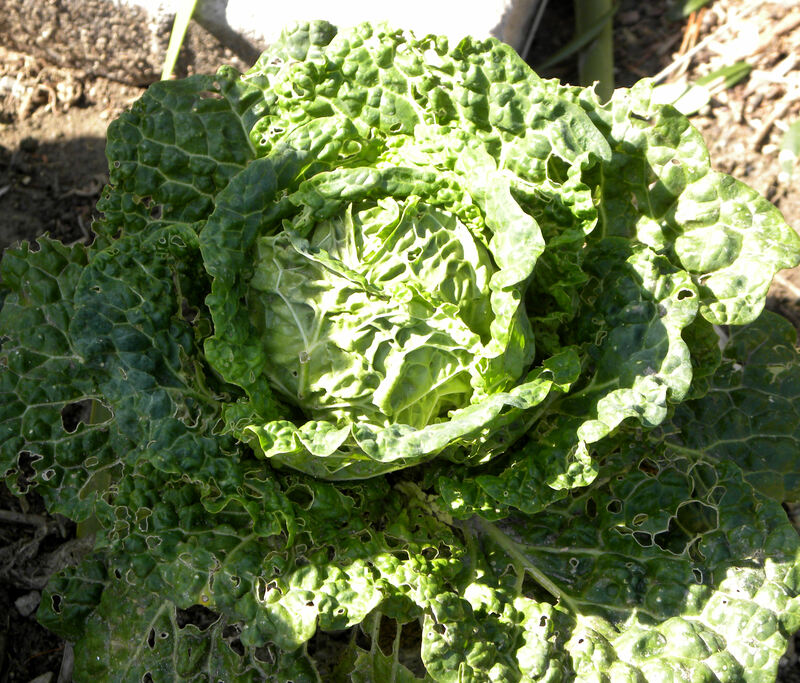 I have navel oranges bigger than this head of savoy cabbage. Well, it's trying. The chickens and I have been working on weeds in the Garden of Perpetual Responsibility. I pull them, they eat them. 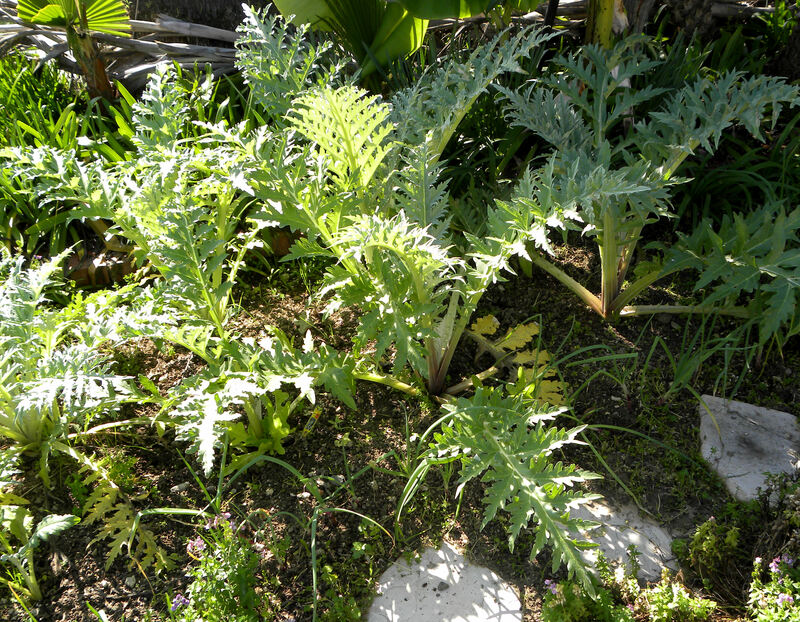 Finally I can see my eight artichokes and 50-plus red onions above the weeds. Someday in the next month or so, this garden should get some sunshine as the sun moves north (or we tilt, however you look at it). 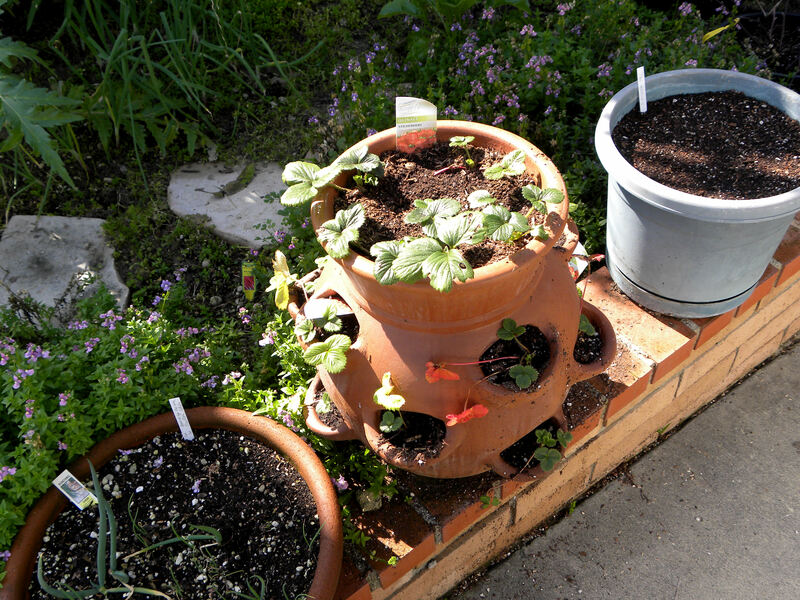 Green onions, strawberries and ginger grow in pots along the driveway. I can hardly wait to see a sprout in my pot of ginger. I'm not so organized that I have an all pink garden. 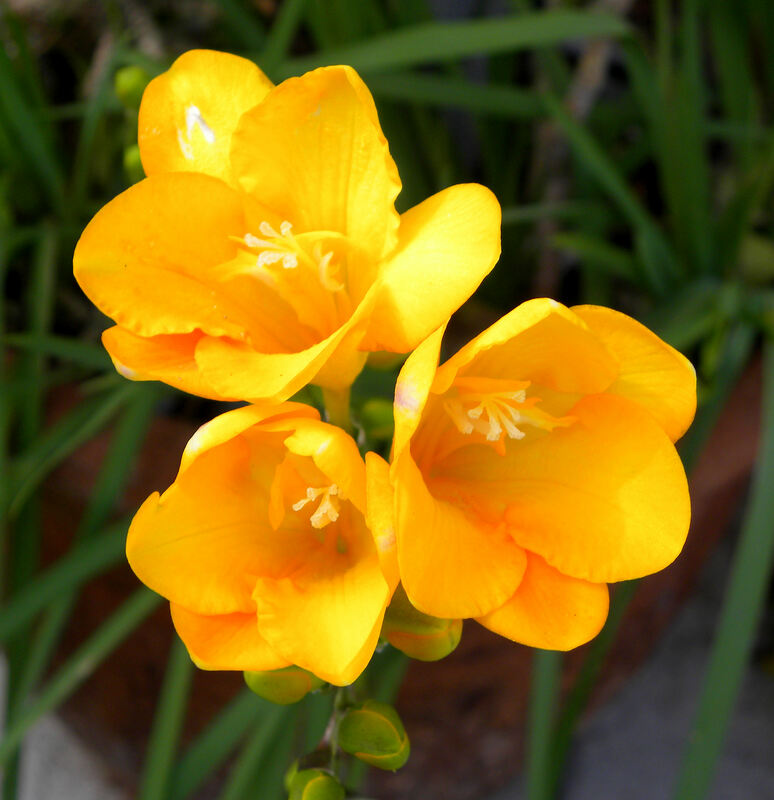 The first of my freesias opened this week and they're everywhere. They've naturalized in the yard and I just let them grow. 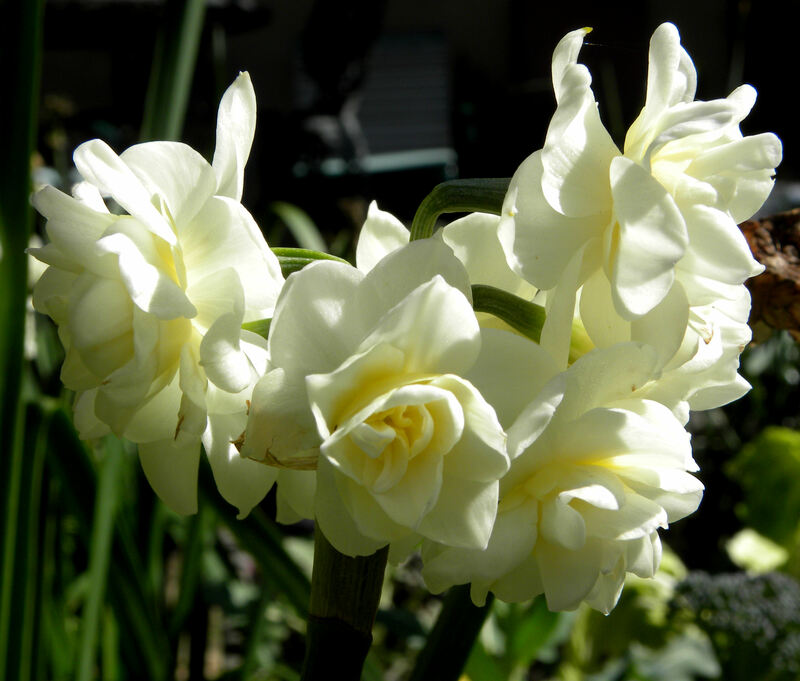 They fill the spring air with a delightful fragrance. 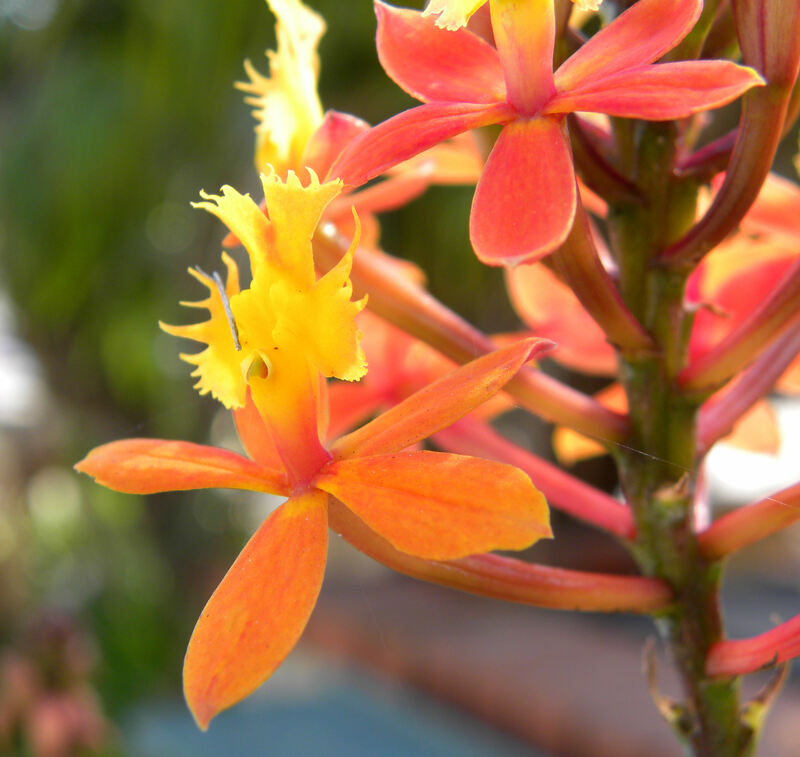 These lovely little Epidendron orchids bloom all year long. I have several pots of them. Other year-round bloomers in my yard are Nemesia, allysum, gazania, rosemary, lavender, lantana, and probably some others I'm forgetting. Whoops, one of my readers pointed out that these are Epidendrons, not Dendrobiums. I was given this orchid by a friend, and misidentified it. The lavender Scabiosas are doing well this spring. 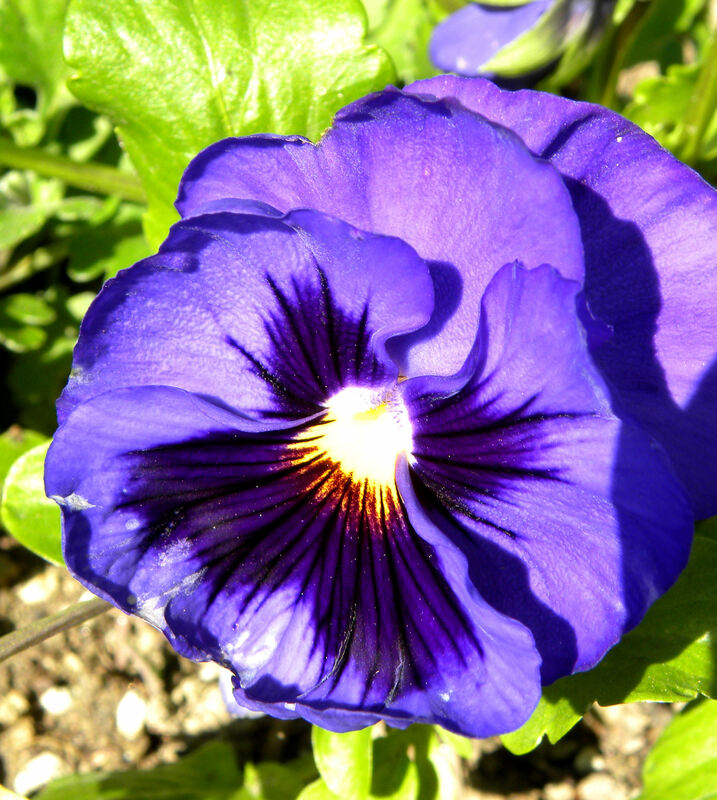 Pansies grow in the flower border of the Garden of Infinite Neglect. Oh, look, I have a lavender theme going.I want to try making some lavender sugar this spring. Apparently you just pick the flower heads and put them into a sealed jar of white sugar for a few months. 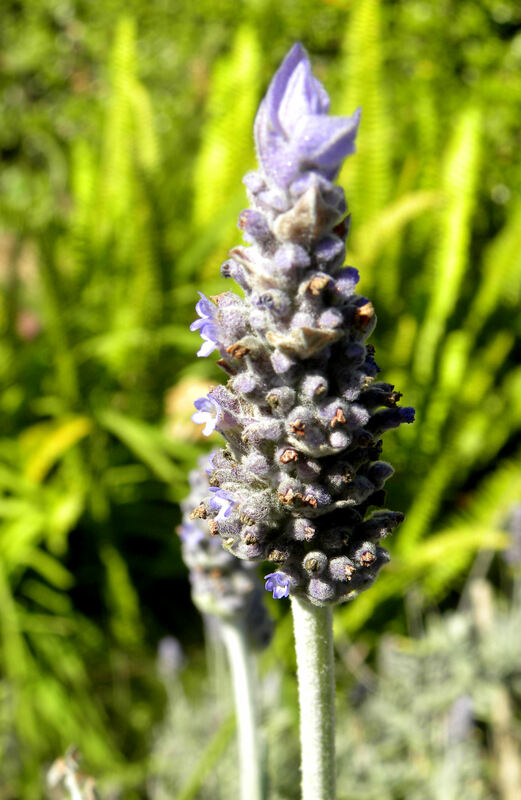 Lavender smells wonderful and attracts bees to the garden. 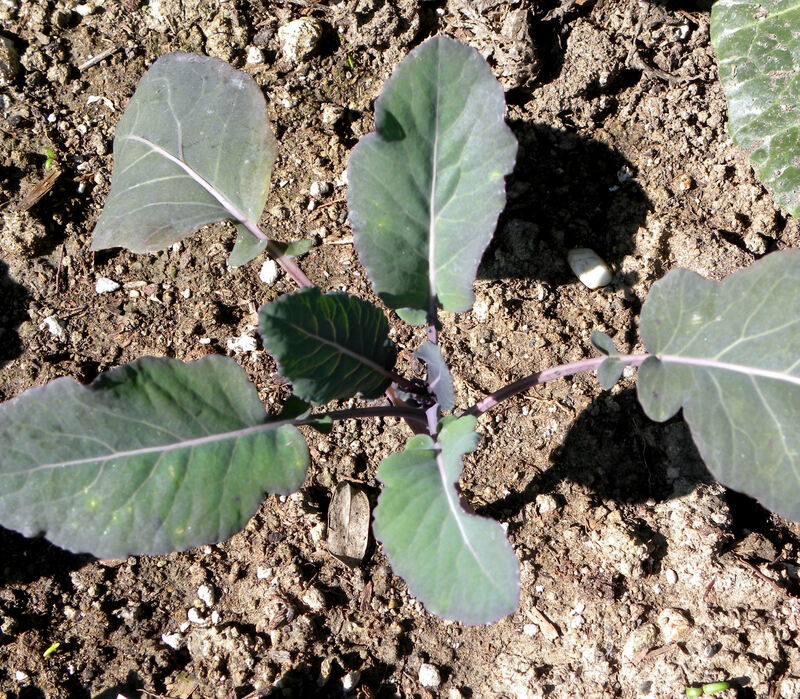 I'm growing purple cauliflower this year too, a new variety for me called Graffiti. 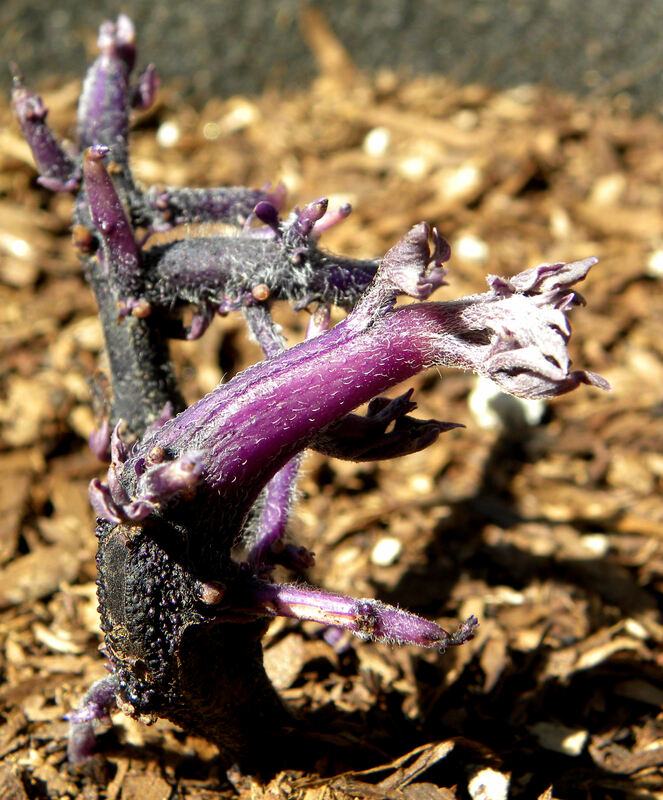 I'm even growing blue potatoes. Here is the first shoot. So much for the front yard. On to the back. 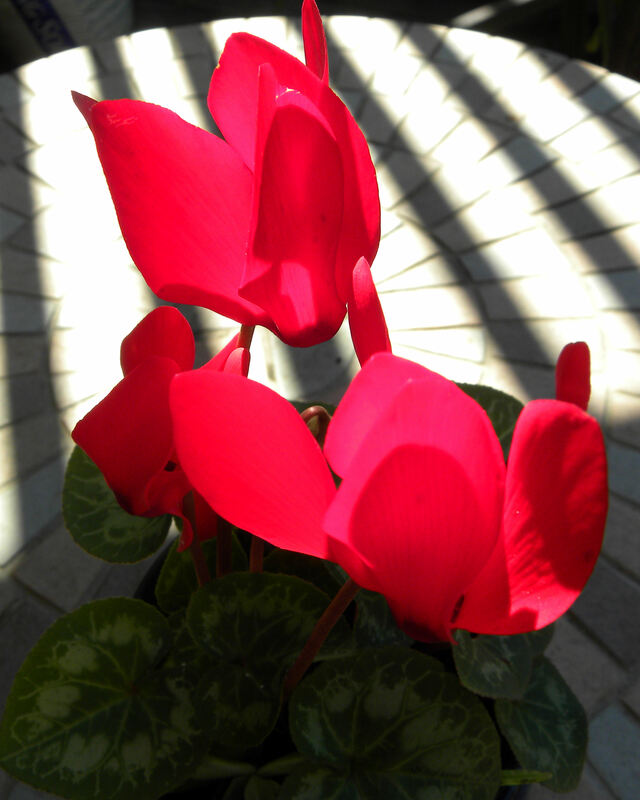 I liked the play of light and shadow with this wacky shot of a red cyclamen. 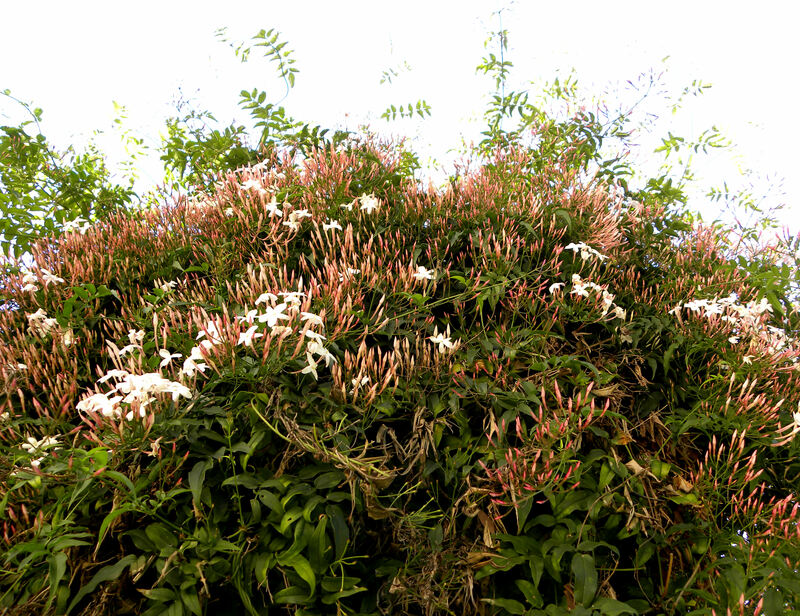 Masses of pink jasmine grow up two trellises and over our deck, filling the air with a sweet, heavy scent. 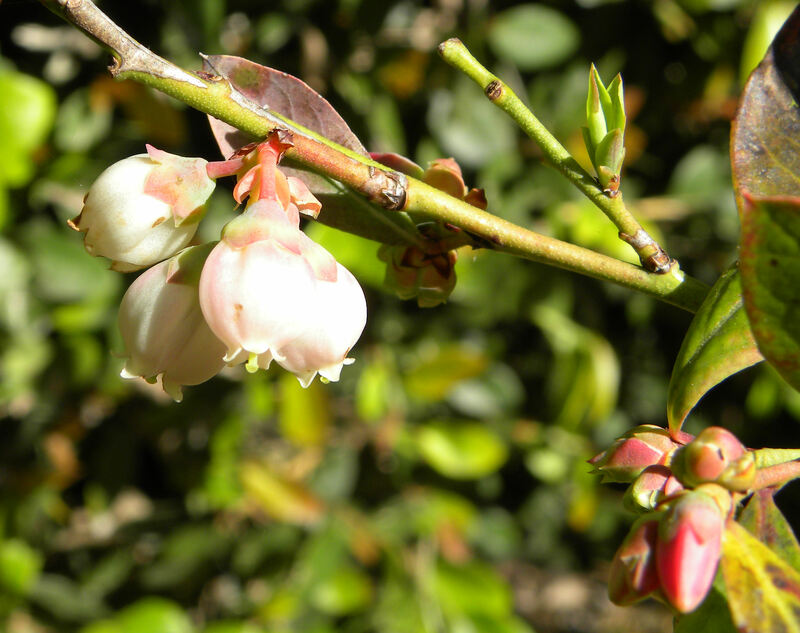 The first flowers just opened on the Sunshine Blue blueberries. 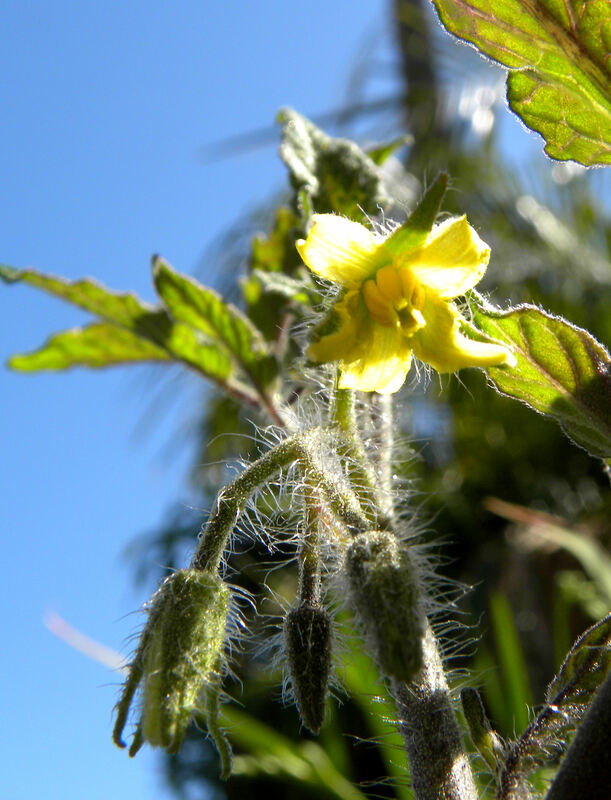 The first flowers have opened on my tomatoes. This one is an Early Girl. My citrus harvest is winding down. 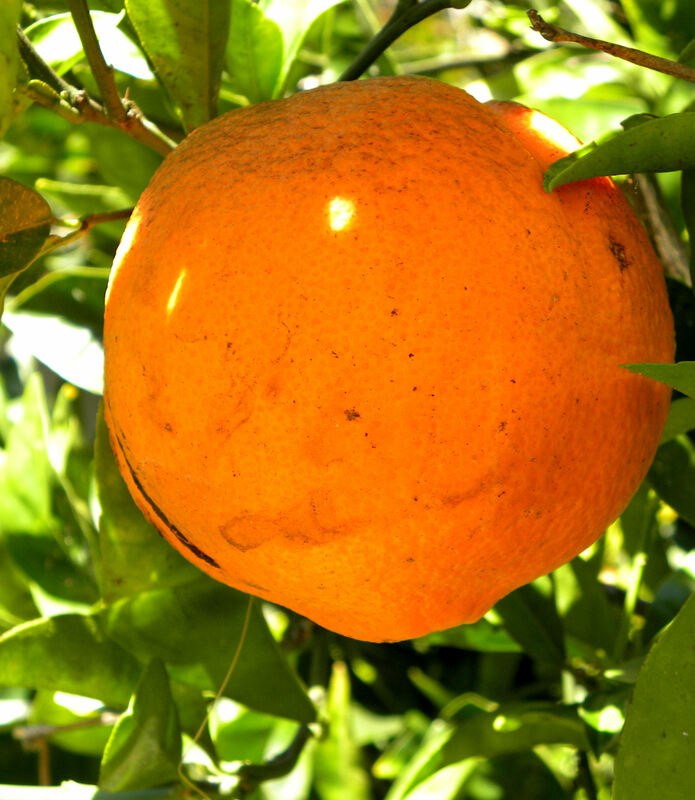 I have five navel oranges left, and three Valencia oranges (the entire crop from that new tree), which I won't harvest until the navels are gone. My limes are long gone, but I still have a baker's dozen of ripe Meyer lemons, four ripe Eureka lemons, and more lemons coming along. 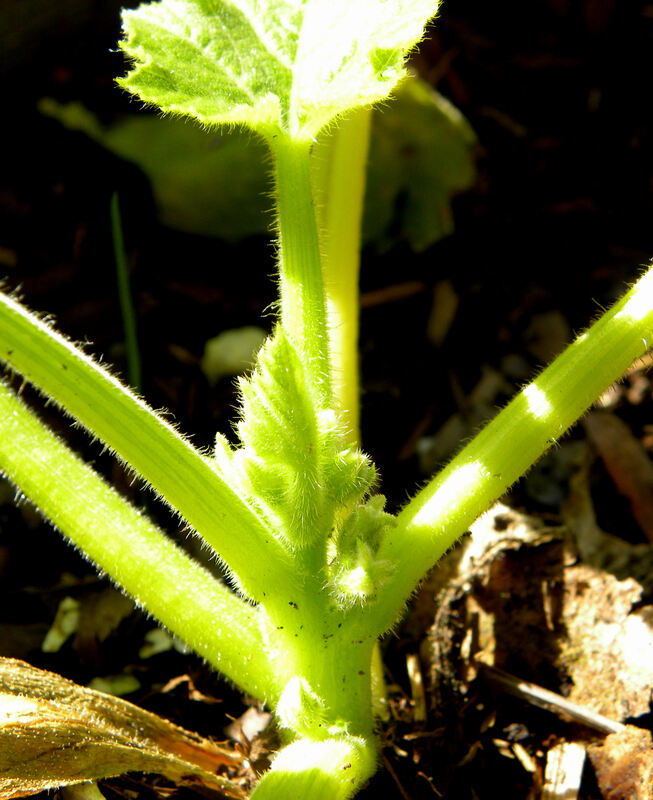 I'm experimenting with a January planted zucchini. The first tiny buds have just appeared. Remind me later in the season how excited I am by this. 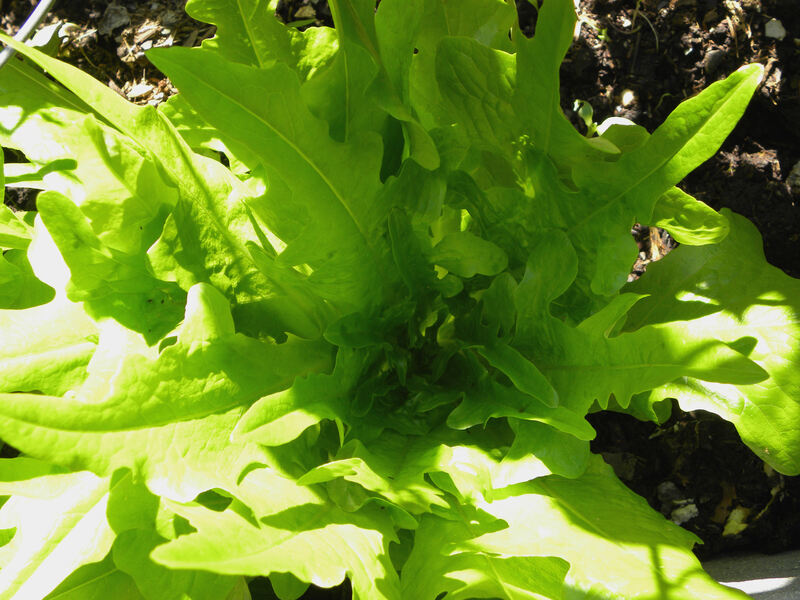 I am currently growing this Green Oakleaf lettuce, plus Red Saladbowl, Lollo Rossa, Red Sails, and Black-seeded Simpson, in addition to a tray of mesclun salad greens. I planted these double paperwhites around my raised beds fairly late in the fall, so they're in prime bloom now. I also grow nasturtiums and parsley around the raised beds. 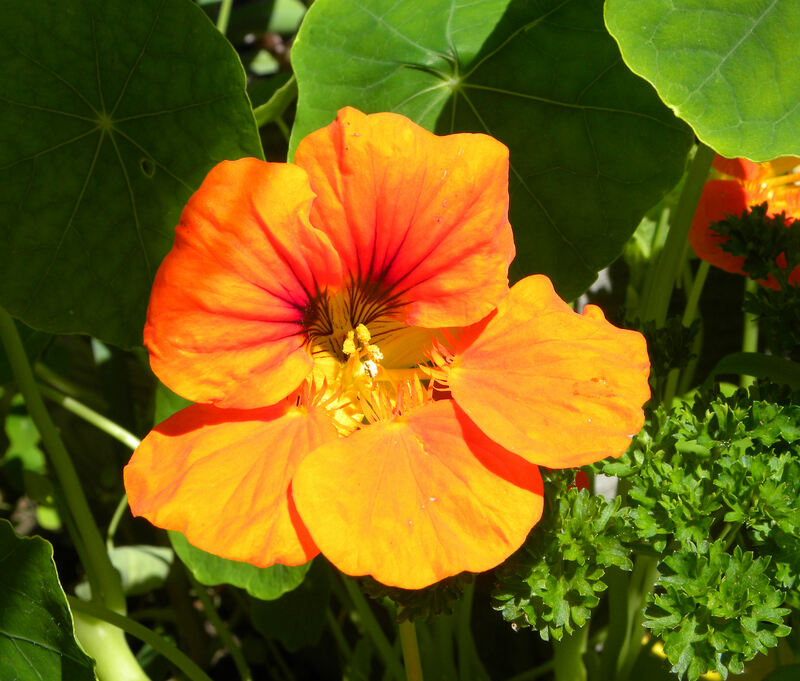 The nasturtiums are just beginning to bloom. 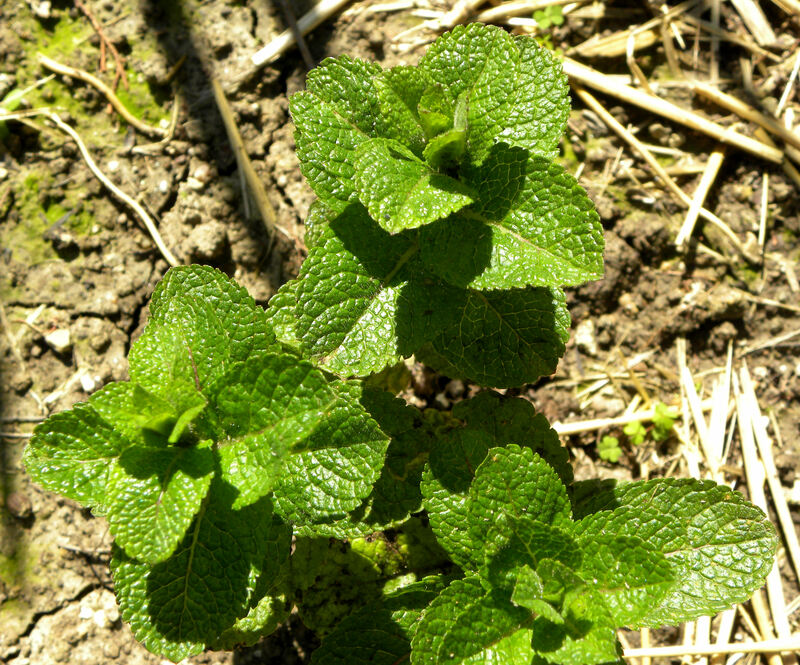 The mint never totally dies back in winter, but it's just now getting its spring growth spurt. I use it for tabbuli. Those tiny fuzzy things are baby Florida Prince peaches. 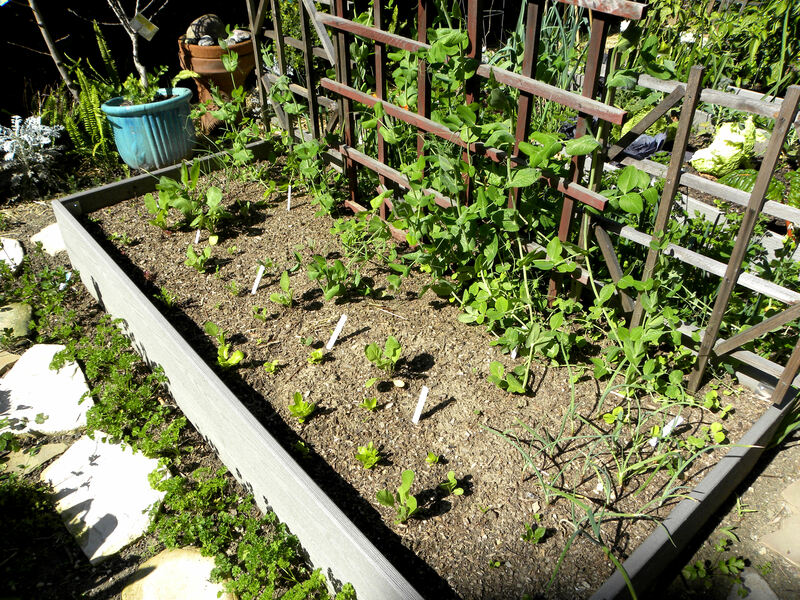 Raised bed #3 has been in a state of suspended animation since I planted it last October. It's finally starting to grow now, with lettuce, spinach, radishes, cauliflower, red and yellow onions and Super Sugar Sprint peas. 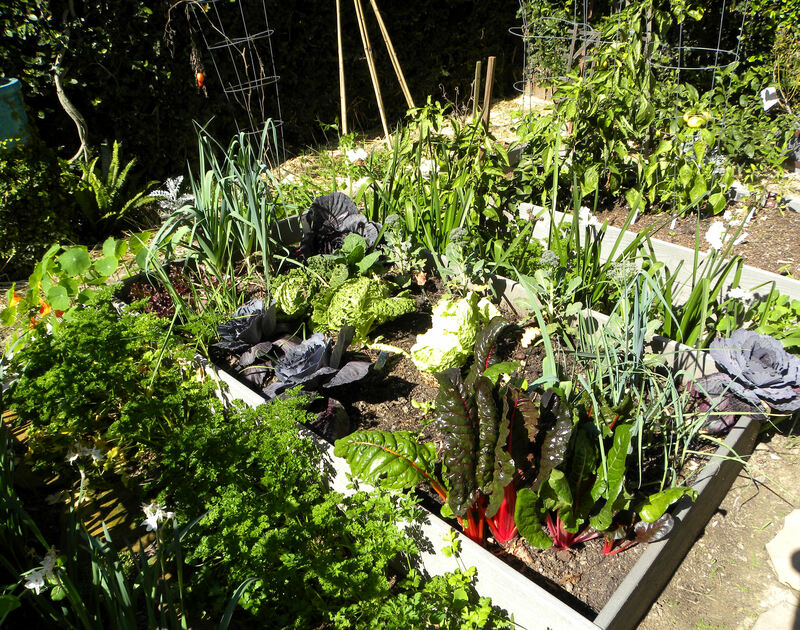 My three raised beds give me a lot of pleasure as well as food. 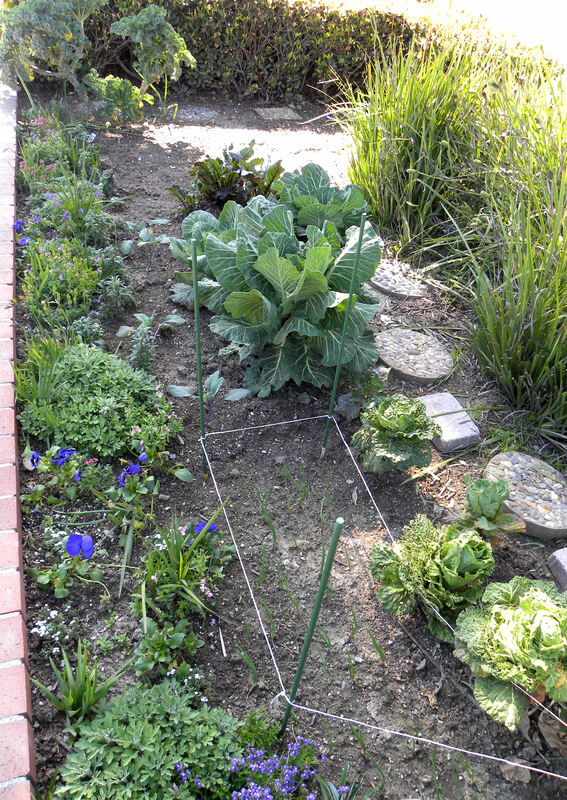 Bed #2 is featured in this photo, with chard, red and green savoy cabbage, leeks, lettuce, and garlic. Behind it is bed #1 with bell peppers, garlic, mizuna, lettuce, carrots, parnips, and chard. The three apple trees and the plum don't show up well in this photo because they're still dormant, but you can see our coop where the three hens live. Spring is such an exciting time in the garden. I hope you enjoyed your tour. 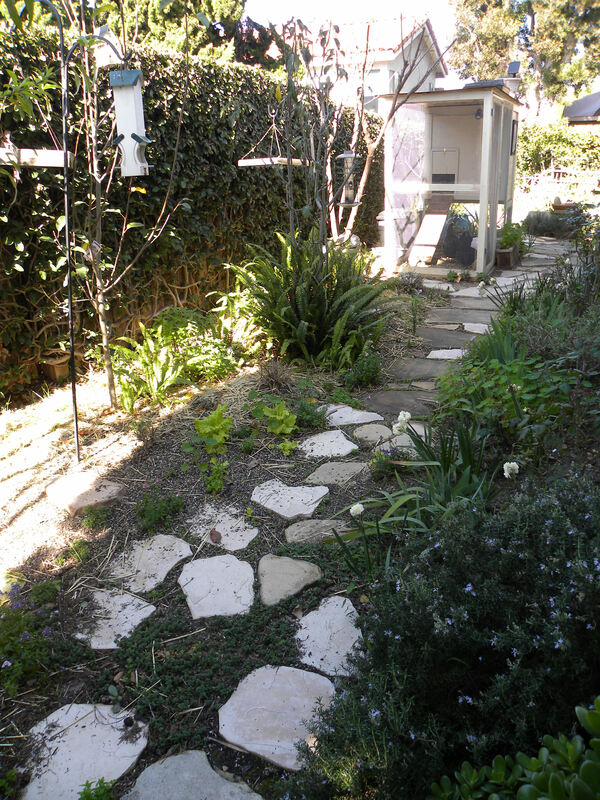 This entry was posted in Uncategorized and tagged backyard chickens, blueberries, cauliflower, chard, chicken coop, citrus, flowers, Gardener's Supply Company, gardening in containers, hens, lemons, lettuce, oranges, peach trees, photos, pond, raised beds, southern California, vegetable garden. Bookmark the permalink. With all the different photos it makes your garden look bigger than the dimensions you state. And I never would have known that your savoy cabbage was so small if you hadn’t told us all. Hi Daphne. When I’m weeding my garden, it seems bigger too. Guess that shows that things aren’t always as they seem. 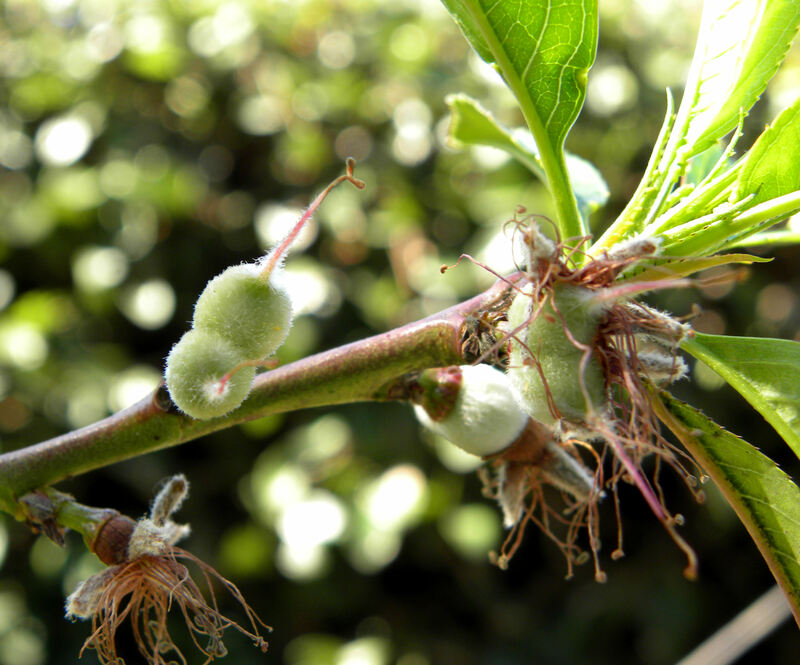 Are there any fruits that can be planted now and harvested by may or june? I know they recommend strawberries be planted in fall – can I get away w/ a successful planting now? Hi Gabi. In coastal southern California, it’s time now to plant strawberries. I suspect that if they’re selling plants in the nurseries where you live, that it’s the right time. I had blueberries in May from spring-flowering Sunshine Blue blueberries the first year, so that’s another option. Raspberries and blackberries do much better the second year, but will produce a small crop in June the first year. Hope this helps. Thanks, Helen. I’ve corrected the misidentification on that post. I suspect I’ve used dendrobium instead of epidendron more than once. Those darn “dendros”. I arrived to your blog after searching -Dendrobium- in Google Images. As HelenB told you before there is a picture with an Epidendrum but the description wrongly says Dendrobium. Hi FEDe, I corrected the body of the post, but not the figure legend. Now that has been changed from Dendrobium to Epidendron. Nice website! Came across it while looking up Meyer Lemon info. I have lots of questions about what you’re growing, but since it’s holiday, they’ll mostly wait until next year. But can you tell me if the dwarf Eureka lemon is easy to find and grow in a pot? I find the sweetness and slight “grapefruity” flavor of the Meyer not the best for classic lemon dishes (but love the fragrance of the blooms, and its prolific nature). Have a Merry Christmas and Happy New Year!